I honestly was joshing, but that would be awesome! Since the board has been designed with the help of Input Club it should be feasible, since they have alrerady done it for their Infinity pcb. Granted, the Whitefox pcb is more complex (LEDs) but slightly larger pads may not be that big of a hurdle. I would gladly give it a try once the files are released if I knew how to use KiCad. it's not a technical issue but more logistics (more switch options for one). I learned that it's easier to design a product than actually bring it to your home. That's a fair point I had not considered the logistical side of things obviously. Is there any way to get the LEDs on their own? I have switches and keycaps but I've got no LEDs due to relying on sethk's GB. The FAQ at this link should give you what you need to source LEDs. Search for "1.8 mm LEDs" on ebay and you should be set (most kinds of 3 mm LEDs should work as well, but 1.8 mm are shorter, which does not hurt if you want to use thick keycaps). I'll try to keep the base kit as bare bone as possible, so more experienced users can get a WF at a very interesting price point. LEDs are very easy to source (ebay, mouser, farnell, ...) and cost basically nothing. Awesome, definitely glad to hear that. LEDs are pretty cheap, I always use eBay and getting a U.S. seller is a little more but ships so much faster in the states but still pretty cheap for a pack of 100. Wait, so how do the plates work, can I not get an iso winkeyless plate? Do I have to choose between the two? Yeah, when I saw that I was extremely surprised. I think Massdrop may have gotten it wrong since Matt3o said it wouldn't be shipped until like February. does anyone know the estimated price for this? How heavy is the whole keyboard? I'm not quite sure how exactly the alu bottom is built. Is it just like a low-profile tray that gets "capped" by the plate, which also serves as the case top? Matt3o, suppose I want to order a custom plate elsewhere, because the options given do not please me. If I use the plate builder tool from swill, what are the configurations I must use on screw diameter (probably 2mm, you said you use M2 screws), width & height paddings and corner radius? Keyboard weights approx 800g. The case is a tray covered by the switch plate, the plate is also the case top. The top is flush tough not recessed. I'll release full specs asap. Will there be a way to get a 1.75 control key? Also what switches are people looking to get with this, for someone who's new to Cherry switches which ones would you recommend for gaming? I was thinking of going with Clears or Zealios. They opened a discussion page for the board on Massdrop. You can find it here. Zealios are all the rage, but you can't go wrong with Reds or evens Blacks for gaming. There is no best switch for any kind of use anyway, it's down to anyone's preferences. If you search the forum you'll find tons of threads named "are Reds good for typing" or "are Clears good for gaming" and lots of people answering "yes, they are". Also according to the mockup on MD there will be 1.75 control and fn keys to replace capslock. Thanks guys, didn't see the extra pictures on MassDrop. So my next question for matt3o is, which switch will you be using in your white fox? PS: the one I have now is a variable Cherry MX green+blue+white. It's pretty nice actually. I don't know why it bothers me, but is it "Matt3o" or "matt3o"? I always thought the "M" was uppercase, but Massdrop wrote it all lowercase. matt3o is when I feel more robotic, Matt3o is for the human part. there will be possibly a bluetooth version, but it will take some time and I'm not sure the case could be full alu (due to interference). I could totally see a bluetooth version of this being something I would use. I've been debating on the switch to use as well and I think you just helped me make up my mind -- MX White with white tops! 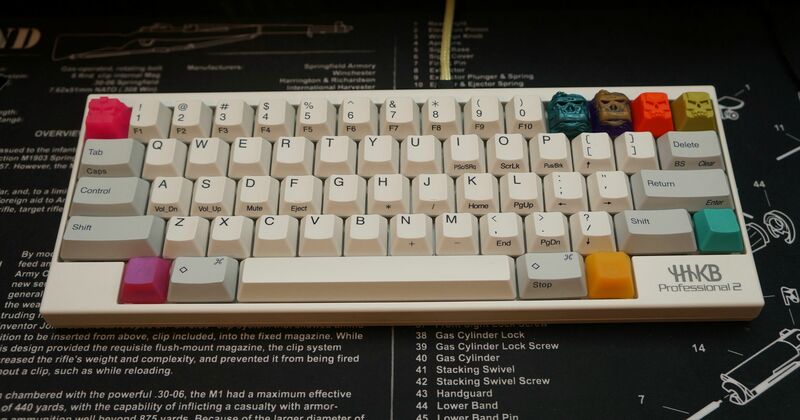 The whitefox is now TMK ready! https://github.com/tmk/whitefox thanks to Hasu! that's actually a very nice idea. where do you get the white tops? Any chance that this will support Alps? 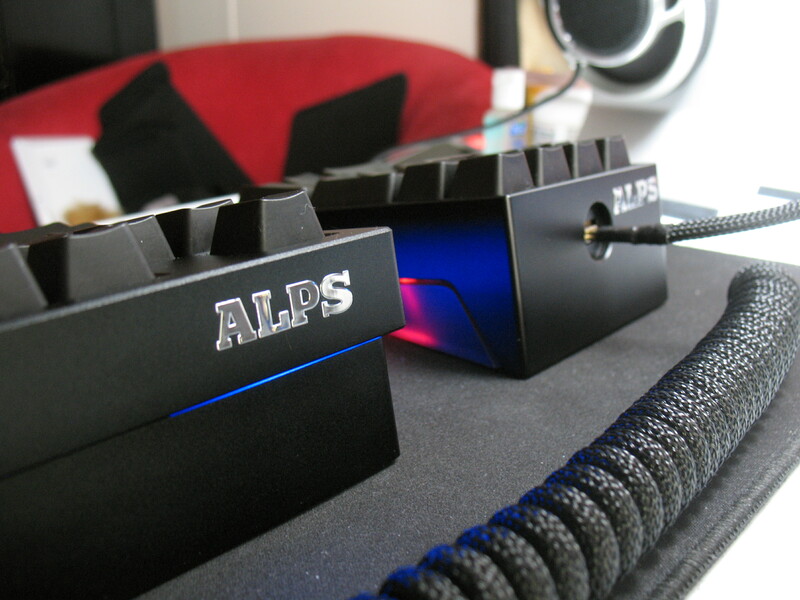 I am all about pushing the Alps love over here! It's already been mentioned in this thread and in the OP it's only supporting MX. You'd have to do a mod like E3E did on his Eagle PCB. 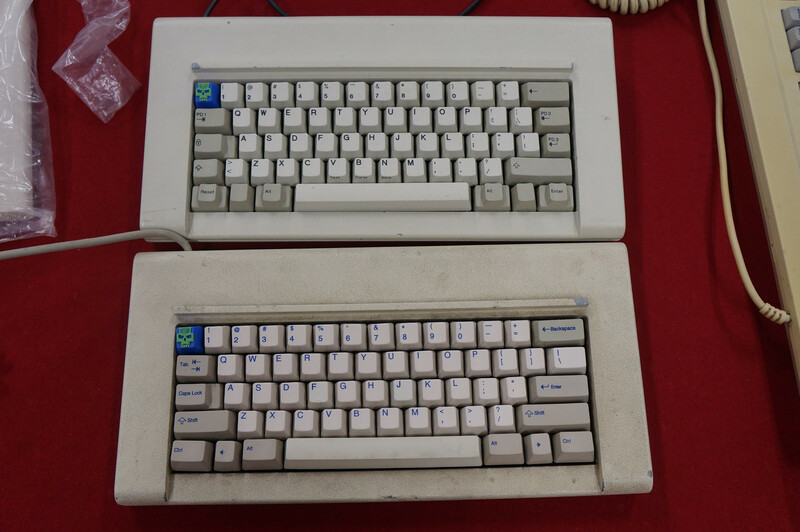 I'd be happy to modify it to Alps for you if you're really itching for an Alps 65%. Would have to take a gander at how close the traces are to each other, but regardless, it could most likely be done. I got them as part of the original AboStudio Group Buy kinruan did back in -- YIKES -- 2013. 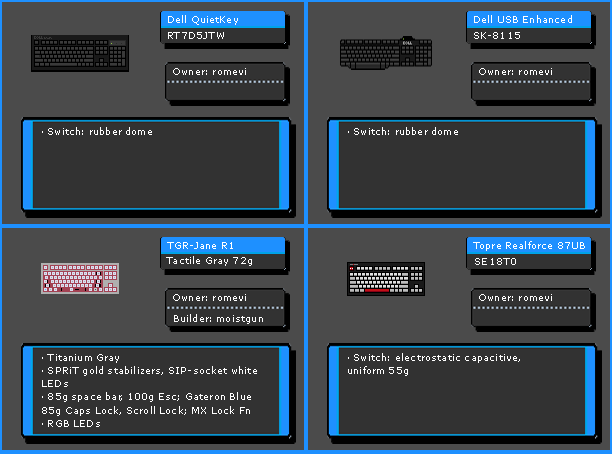 Depending on the details, maybe the best route would be to open-source the PCB files sometime near the close of orders, then you can adjust the PCB to be ALPS-only, then have a separate (PCB-Only?) GB for Alps-Adjusted-Whitefox. But I have to side with Matt3o that concentrating on a single product, makes it more likely to be completely produced. Yeah. There's no Gateron equivalent for an MX-White is there? Nah. Whites are clicky, but a very soft click. I guess you'd have Gateron Blues and mod them somehow to make them quieter. More work than its worth, I'm sure. Yeah. If you don't mind opening all the switches, I hear that it's just a matter of more lube on the slider's legs, but that might be speculation rather than fact. I can't be sure. All I know is that I want some damn vintage MX whites. In general, I think it's stated that lubing clicky switches in the MX family quiets their clicks a bit. This is one awesome keyboard, and I definitely want one. I have a few questions though. Will we be able to get parts by themselves? For example, just the case or just the PCB and plate. Sorry of this has been answered already. Also, do you have any tips for building a keyboard from scratch? I wanted to try and make a keyboard, but I am very much a beginner. Also, do you have any tips for building a keyboard from scratch? +1 I could see myself using a bluetooth WhiteFox as my media center keyboard. will this drop have a bluetooth option? Argh can't get it assembled with Zealios. At the moment i've ordered it as a kit, but wondering what people would recommend if I get an assembled board? Will it be hard to assemble for someone who has 0 experience of soldering? Not at all. Soldering is easy peasy. Just don't hold the iron to the switch pins for too long because you might melt the housings. Just enough for the solder to wet the pin and the pad and create a secure joint. Switch soldering is one of the easiest things to do. Don't be intimidated! I remembered matt3o mentioned wanting to keep the production at 500. Was it MD that went against your will for 1000 units?